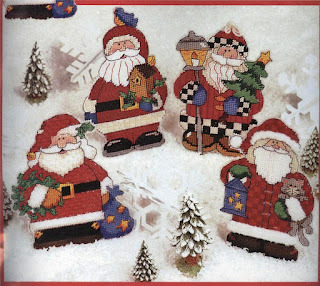 Plastic Canvas is truly one of the easiest needlepoint crafts and these Four Jolly Santa Ornaments are sure to add a touch of fun to your Christmas decorations. Handmade ornaments always make excellent Christmas gifts, but it would be hard to part with these Jolly Santas. Perhaps, you could simply give away one of the ornaments and keep the rest to hang on your own Christmas tree. These fun Santa ornaments would also make great gift tags on a Christmas gift! Not only would they make a pretty decoration on the package, but they would be a separate gift themselves for the recipient to hang on the Christmas tree for decades to come. 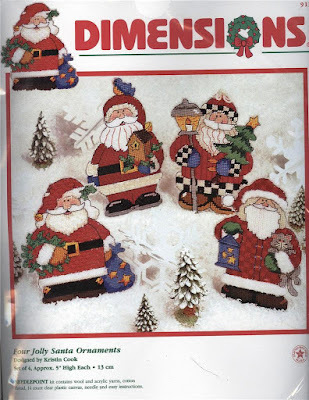 The Four Jolly Santa Ornament plastic canvas kit is made by Dimensions, which is has been a trusted needlecraft company for many years. Their kits are always exceptional. This kit includes everything you need to complete the Four Jolly Santa Ornaments. The package contains the plastic canvas, the yarn, thread, the instructions and even a needle. Just creating the happy faces on these ornaments will give you a great deal of pleasure!